Some of the more right wing press would have you believe that the Human Rights Act is an evil, foisted upon us by Brussels. It’s purpose portrayed as allowing terrorists and would be terrorists to remain in the UK housed and fed at tax payer expense. Perhaps for 0.001% of people. For you, me, and everyone else, it protects (among other things) our right to a fair hearing, access to justice, a prohibition from torture, prohibition from slavery, a right to life, a right to privacy and family life. Why on earth would the Government have a problem with this? In past months, the wording of the Act has caused problems for the Government’s cuts agenda. Sir James Munby, President of the Family Division of the Court has invoked the law himself, to ensure that adults with learning disabilities aren’t left without legal representation to combat their children being permanently removed from them, in absence of any legal assistance. It’s shocking and shameful that he needed to do so. The case D (A Child)  EWFC 39 sets out clearly the dilemma faced by the parents, and how, were it not for the Human Rights Act (and a President of the Family Court willing to stand by them against a Government who was not), two very vulnerable adults with profound learning difficulties would have been expected to conduct their case against social services (who had the benefit of a legal team paid for by the State). The Human Rights Act isn’t there for terrorists, or Governments, but for you, and me, and your neighbour, and your children, your friends and your parents. Ordinary people, who need that protecting, and at the moment, more so than ever. A past article by us, on “Legal aid cuts, litigants-in-person, and exceptional funding” sets out further examples of how Sir James has applied the Human Rights Act to ensure that in the family court, allegations are fairly heard, cases conducted in a way to protect the vulnerable, and that a ‘human’ dimension is applied when the most precious relationships in life are at risk. Law Society president Andrew Caplen, said yesterday “Access to justice for everyone is the mark of a civilised society.” He went on “The Human Rights Act is a fundamental safeguard of many of our basic rights and freedoms. We will be pressing the government to retain it.” We welcome him saying so, and echo his view. 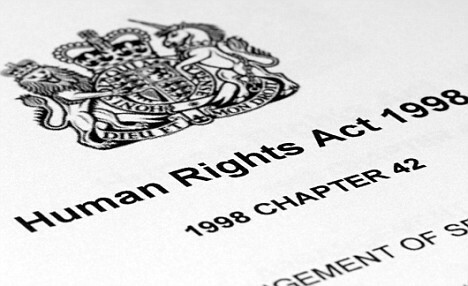 The Government may say that they wish to abolish the Human Rights Act as they want rights linked to responsibilities. In D (A Child) it was clear that the Government felt the responsibility for arguing against social workers and their State funded solicitors and barristers was the responsibility of two adults who lacked the mental capacity to do so… and that is why you, I, and everyone who doesn’t have a spare £100,000 in the bank need the Human Rights Act, and should join the Law Society in fighting to retain it. We answer many questions in our guides, but here’s another… What sort of Government would take parents to court to remove their children in the knowledge the parents lacked the capacity and finances to achieve a fair hearing? That one’s easy to answer. Yours.